Turner Classic Movies finally ran My Son John this week. I’ve been hung up on Leo McCarey’s fabled fiasco since driving down to Raleigh for a rare 35mm showing in October 2007, an event covered previously here. Seeing it again on TCM inspired me to further excavations. I wrote before of ABC having run it around 1970, and no one else doing so since, at least on American television. Turns out that network’s broadcast actually took place April 29, 1973, and again on September 2 of the same year. ABC’s Sunday Night Movie played My Son John both times in a two and a half-hour time period between 9:00 and 11:30 PM. The New York Times listing described MSJ as an artful grovel to the late Senator McCarthy, a pretty good indicator of how political winds were blowing by 1973. Most of us too young to have seen it in 1952 made acquaintance here, as Paramount never reissued My Son John theatrically nor in US syndication. Specialty bookings maintained legend gathering around what was said to be the most rabid of anti-Communist tracts. New Yorkers glimpsed MSJ as part of a Leo McCarey Festival held at the Madison Avenue Presbyterian Church (!) on August 24, 1977, while The Collective for Living Cinema, a Lower Manhattan alternative and avant-garde site, played it during November 1980. As My Son John never surfaced on video, some imagined the film had been suppressed, even as there was non-theatrical availability in 16mm from Films, Inc., at least until that rental house closed its doors. Online forums propagated rumors of TCM "banning" My Son John for their not having played the feature, ignoring less provocative likelihood that programmers couldn’t be bothered with such an obscurity. Turns out Leo McCarey was longer gestating My Son John than I’d realized. He began with anything but a completed script (I have one point, the director said, Does it matter how I arrive at it?). The story was McCarey’s, but he brought on John Lee Mahin and Myles Connolly to flesh things out. 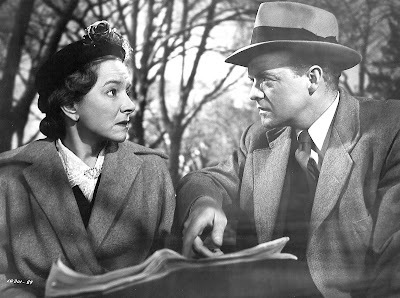 He spent autumn of 1950 in pursuit of Helen Hayes to star. Getting her would be a coup, as the self-described First Lady Of The American Theatre had been off movie screens since the mid-thirties save for a cameo in Stage Door Canteen. Hayes’ participation was a major selling point for My Son John, as other casting followed close behind her agreement to star. In December of 1950, McCarey described his project as highly emotional, but with much humor, this being lure that brought Hayes aboard. His films were best loved for gentle humor and heart appeal, reliable handmaidens to a sock boxoffice as proven by McCarey with Going My Way and Bells Of St.Mary’s. My Son John’s story would remain top secret even as the forty person crew arrived in Washington during March 1951 for location work, including principals by then in place. Several weeks were spent there, but little of what they filmed made way to the final print. McCarey admitted that his script is in far from final shooting shape, adding that I knew enough of what I wanted in Washington to do some exteriors and other background shots here. At that point, the director hoped to finish My Son John by early June for late 1951 release, though wandering around town in search of interesting backgrounds wasn’t getting the job done any faster. 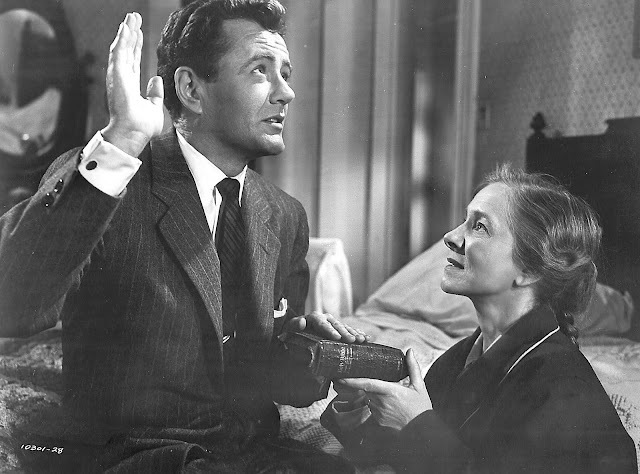 One entire day was spent filming Helen Hayes in a Catholic church McCarey had come across and liked, but none of this footage would be used. We’ve only shot one scene that was in the original script, observed his star actress. Being producer, director, and busy re-writer gave McCarey authority to make whatever changes suited him, even as slow pace of production brought him closer to rendezvous with Robert Walker’s unexpected passing on 8-28-51. Walker had been a loan-out from MGM, still home lot for the actor. His participation in My Son John is what gives the film its primary interest for me. Bob brings all the fun of Bruno Anthony to his performance as prodigal son John, a less privileged first cousin reduced to office droning that Bruno would have deplored in Strangers On A Train, with low level treason barely a step above catching the 8:15 in the morning to sell paint or something. 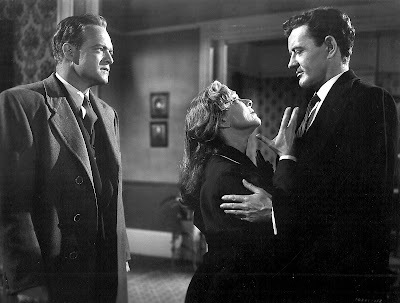 And what of detective Van Heflin worming his way into family confidence as means of trapping one of their own, much in the same way MacDonald Carey did in Shadow Of A Doubt? Son John is a clear amalgam of Bruno and Uncle Charlie, so much so as to suggest Alfred Hitchcock himself lent a guiding hand. My suspicion as to that found confirmation in a March 1951 interview Leo McCarey gave to The New York Times during production on My Son John. There’s a lot of the suspense element in the film and McCarey boasts of having gone directly to the master --- Alfred Hitchcock --- for pointers, said the article, while McCarey added: This is my first Hitchcock. He even ran off the first four reels of his new film for me. I’m taking a lot of kidding about how I stop before every shot and try to figure out how Hitchcock would do it. I may even put myself in one scene like he does. Those four reels McCarey referred to were from Strangers On A Train, awaiting July 1951 release as he continued laboring on My Son John. Did Hitchcock suggest the partial recap of his own Shadow of A Doubt? And was Robert Walker’s casting the result of McCarey’s sneak peek at those reels? There’s enough of Bruno in John to suggest AH lent advice as regards the characterization. 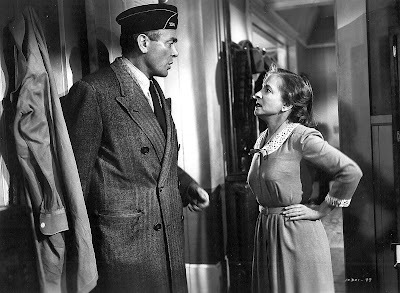 Certainly McCarey showed a very public willingness to be guided by the Master’s counsel, though he drew a line at staging suspense of a melodramatic, "chase" type. 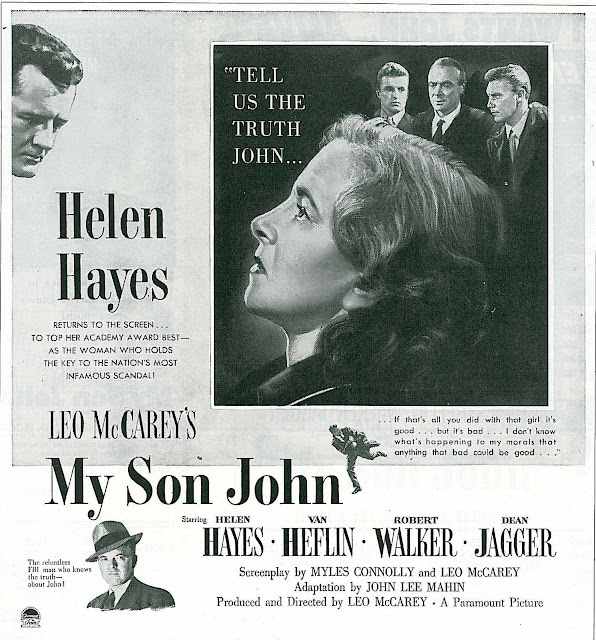 Hoping to start a new trend, according to the article, McCarey identified his My Son John goal thus: It’s more a suspense of ideas in conflict. That may have been the film’s essential problem as things turned out. With Hitchcock fully in charge, we’d have had at the least a full-throttled espionage plot with John at its center, and perhaps a whammo finish atop the Washington Monument. AH would certainly have ditched propaganda in accordance with past policy and delivered a thriller fans might not have waited these forty years to see again. Would My Son John be a classic today if Leo McCarey had collaborated as writer with director and final decision-maker Alfred Hitchcock? I missed the TCM showing though vaguely remember the ABC showing long ago. Here is an interesting take on the film from SLANT magazine. Enjoy. Reading these kind of posts reminds me of just how technology truly is omnipresent in this day and age, and I am fairly confident when I say that we have passed the point of no return in our relationship with technology. 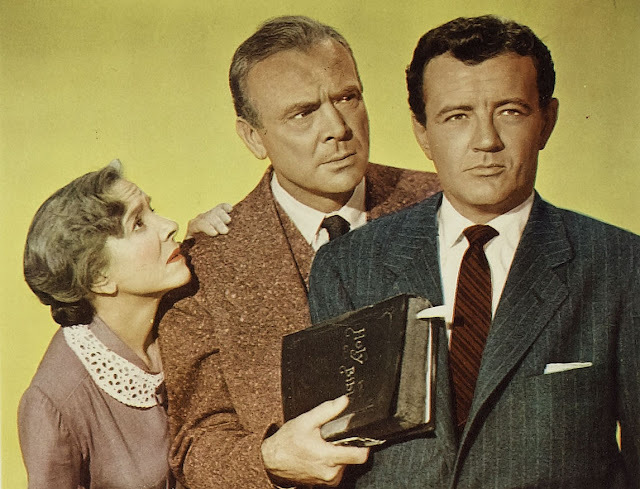 How did 50s Paramount films stay on network TV so long? I remember lots of late 40s-50s Paramounts on ABC and NBC in the early 70s. Possibly because of rights issues, Paramount continued dribbling out the TV debut of its '50 titles all the way into the '80s, when stuff like "Cross My Heart,'' "Mr. Music'' and "The Turning Point'' finally showed up. We're still waiting for Mitchell Leisen's "Darling, How Could You'' (1951) and as far as I know, George Stevens "Something to Live For'' hasn't been seen since its ABC airing in 1974. My Dear Son. Thanks so much for this. I gobbled-up your earlier post on this, several years ago, and so was really pleasantly (in a perverse way, I guess) surprised when you had this follow-up. For the record, I've never seen the picture and I don't think I really want to. Considering everything from Hayes to Dean Jagger's violently patriotic-obsessed character to the truly bizarre sounding finale cobbled together after poor Bob Walker's death, the whole pudding sounds grotesque to an extent that makes "Freaks" seem positively wholesome! However, in all fairness, it should be pointed-out, that at the time this was made, Leo was an enormous power in the industry, and didn't have to play second violin to anyone, even the great Sir Alfred! Leo's reputation made through, not just the Crosby films, but such solid hits as "Ruggle In Red Gaps" (as Samuel Goldwyn called it), "The Awful Truth" (for which he had won the Oscar that year) and "Love Affair" put him very solidly in the front-rank of movie makers. Leo was one of the very few who could write his own ticket at any studio in town and be cordially welcomed. Leo, however, had a major problem: He was as bad an alcoholic as Walker. Some of his films either never got made, or were finished by others because he had a particularly destructive habit of smashing-up cars (and himself) on a fairly consistent basis. I've told you this before, that around 1948, my father and his then-partner, actor/writer Tony Ellis were under contract (as writers) for what I gather was a very short duration to Rainbow Productions. Dad could not say enough great things about Leo in later-years, but did attest to the fact that the term of employment ended abruptly after Leo smashed-up another car one evening. The intended project, with the intrguing title "Adam and Eve" and which was to star James Stewart, was called-off, Dad and Tony's contract was sold to David Butler Productions, and the two moved-over to Warners'. McCarey's method of "improvising" scenes without a completed script was nothing new, nor unique to this project, however -- this is how Leo approached EVERY project he ever did, probably a hold-over from the old Hal Roach days. Sometimes it worked, sometimes it didn't. In the case of "Son John", this just sounds like the most benighted production of anything in recorded history! Before his death, McCarey did several interviews with Peter Bogdanovich from his sick bed. His memory seems to have been going by then, but it's well-worth seeking out, if you haven't done so. Is there available to read somewhere an original script, with some idea of McCarey's original ending (i.e. whatever was written before Walker's death necessitated his murder in the film)? At the Margaret Herrick, they hold two drafts of the shooting script, and both have the ending as was (re)written after Walker's death. I'd love to get a hint about your sources and resources on the MSJ production details you tell so well here. Big fan of your work sir! Hi Andy, and thanks for your kind remarks re Greenbriar. My book, "Showmen, Sell It Hot," has an expanded chapter on "My Son John," which includes notes on sources. No info on script drafts, and don't recall details on changes to the ending. Whatever I know about that would be in the book chapter, as I haven't gone back into the topic since "Showmen" was published.